Time Needed: 30 mins or 15 mins with assistance. Tools Needed: Phillips Head Screwdriver, Flathead Screwdriver (or other small prying device), A Socket Wrench, 14mm socket, 10mm socket. 8mm socket (for speaker removal). 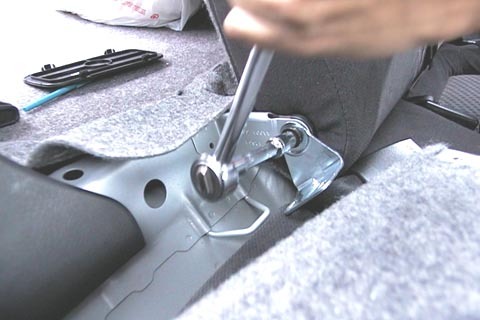 First step is to get your 14mm wrench and undo the bar that holds down the front seat belts. After you get the bar removed you’ll probably want to wrap it up in a towel or something else to prevent it from scratching up your panels while you’re working. 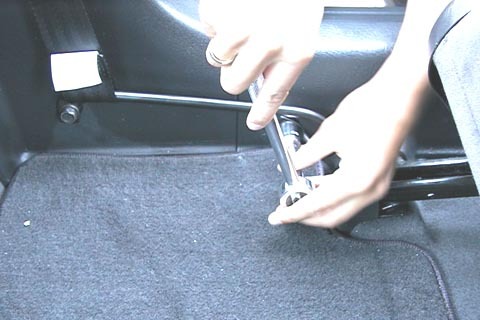 Alright now get your small flat head screw driver or prying device and flip open the little cover underneath the rear arm rest / hand rail. Behind this tab is the only screw that holds this panel on, get your phillips head screw driver to remove it. Now repeat these first 2 steps on the other side. Peel back the flap and you’ll find two 10mm bolts, take your wrench to that and remove both bolts. 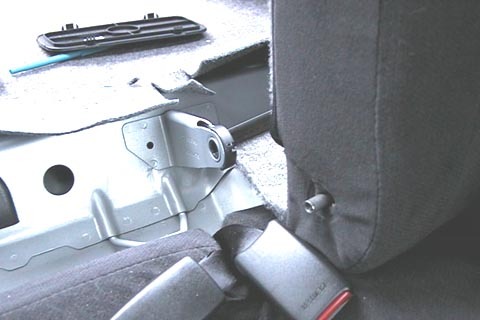 After un-screwing the two bolts you should be able to slide the seat out as shown. Now, there’s another 10mm bolt holding on the 2/3 seat, unscrew that as well and you should be able to remove the seat exactly the same way as the 1/3. With the 2/3 seat you may have to push it a little bit towards the side panel before being able to get the axle out of the middle post. Now going back to the side panel, you will notice a black plastic pop-in screw holding it to back. You’ll want to pop this out. You can either pry it out, brute force it out by pulling on the panel, or you’ll notice a side cover which you can pop off, allowing your hand to reach behind the panel and support it whilst pulling. You’ll want to remove the plastic cover that’s over the C pillar at this point. After removing it, you’ll see this white plastic clip, from this pull it out, and then work your way around the top edge of the side panel. 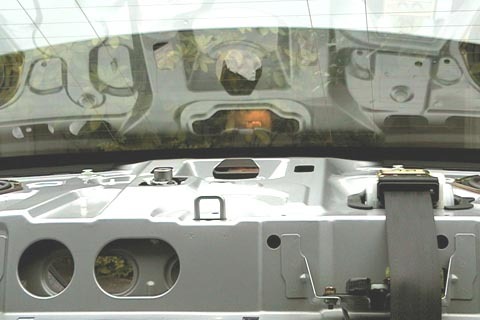 Once you reach the front you’ll need to pull straight up in order to free the panel, from this point on you should be able to remove the entire side panel. 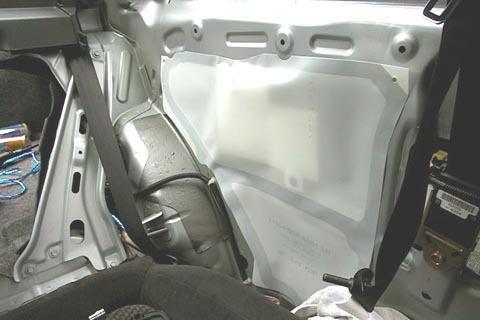 Take caution not to scratch up your panels as you remove them. 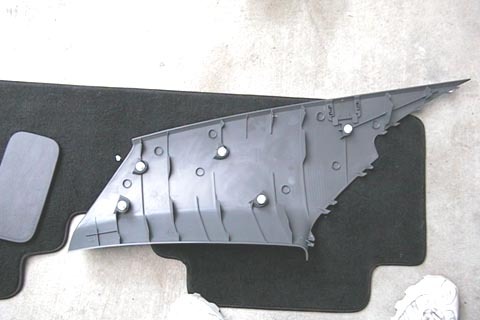 This is what your car should look like after removing the side panel. 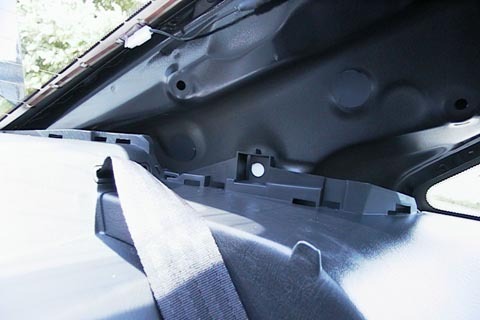 Now before removing the infamous rear deck, go underneath in the trunk and unplug your third brake light. *NOTE* at this point you can also take the opportunity to make the next step easier by taking pliers and squeezing the white plugs that hold the deck down from underneath and loosening them. 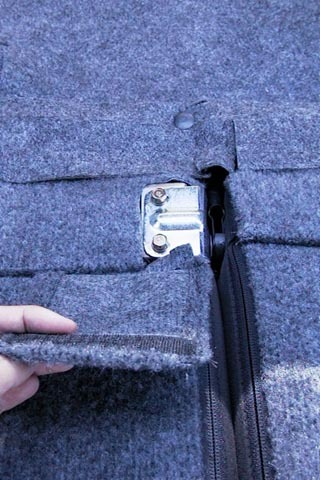 You’ll need to pop out the white clips before giving it a good pull or else you risk breaking them. 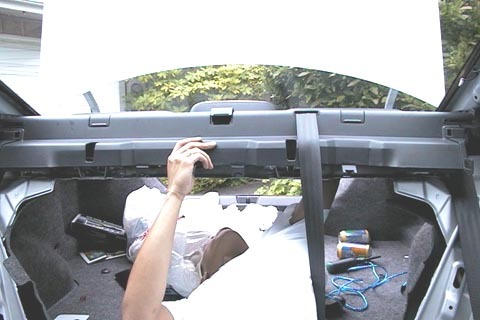 Now yank up and out…you’ll now have removed the rear deck! Now you’re able to get your windows tinted properly, or install those new 6×9’s or clean your windows! Same Deal on the left side. Now before you put your deck back together, you’ll want to check to see if you left any of these white plugs behind when pulling it out. If you did, you’ll want to remove them and place them on the actual deck before replacing. It’s much more difficult to slide them in if you don’t. Also, if you don’t notice them you’re going to have a nasty rattle! 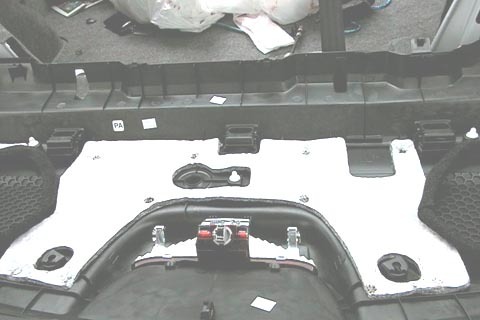 Here’s the underside of the rear deck, there should be a total of 7 white plugs. you’ll see that two are cut off the pic, and there are two missing from the middle holders. Now you can see why it’s so difficult to slide it in if you leave them in the metal deck. 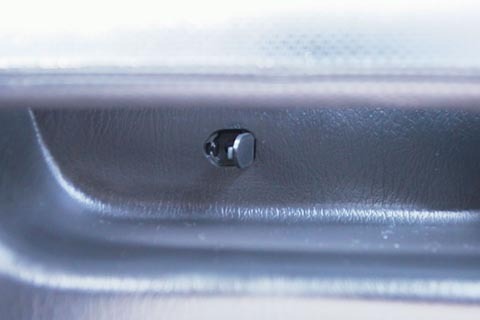 Here’s the locations of the plugs on the underside of the C pillar covers, make sure you pound it in good or you’ll get rattles in your pillar too. 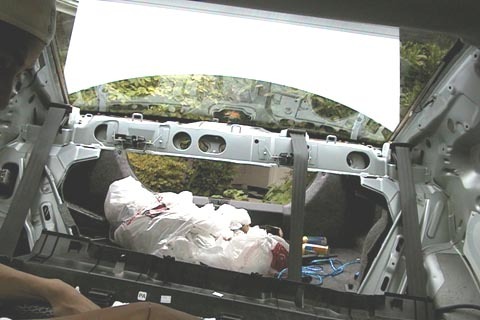 You’re currently reading “Remove The Rear Deck,” an entry on Ghosty’s 2K1 Honda Civic Coupe. Worked like a charm, took me about 2 hours, no issues, thank you! Glad that keeping this around online has helped you out! It works on a 06 civic?? 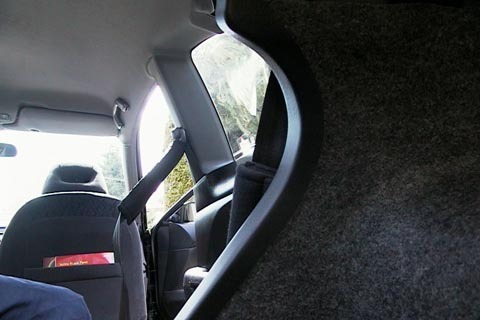 I have a 2003 honda civic 4 door.. the stock rear speakers are 6.5 x 6.5. and I bought 6 x 9. Is there a way I can put the 6 x 9 in there? No these instructions and photos are for the 7th generation Civics 2001-2005. Not particularly easily, you could probably work together some sort of mounting bracket to get it attached but it most likely won’t be pretty. 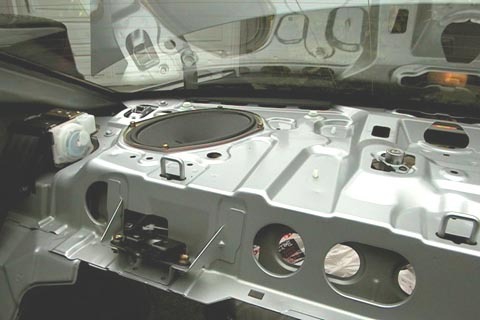 The time and costs involved might also just make it easier to get yourself the proper speakers for your car. True say. I think changing the speakers to the right one is the way to go. Thanks alot! Question: Not all of my speaker holes line up entirely, the rear and front ones are close enough to thread but the other two I can only see half of the hole. Should/Can I drill these out and should I have to? I bought Rockford Fosgate’s that the Amazon’s checker said fit my 2001 Honda Civic Coupe. Just wondering if I should even be considering drilling these out or if two will hold it tight enough? 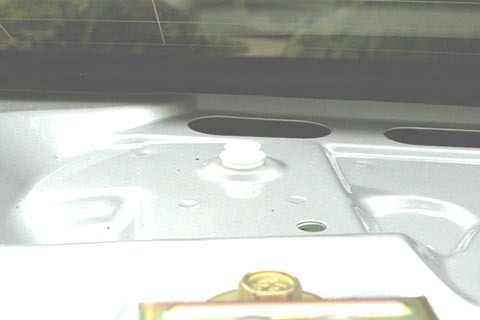 Also, I did realize that the original hex nuts wont work for my new speakers because there is a plastic riser on top of the speakers frame that won’t allow me to have a socket over it, not to mention the one by the window that I had to use a wrench to get out because of the lack of clearance. Just thought I’d share my experience, thanks again! 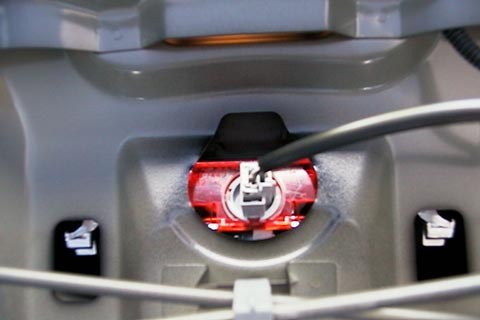 Only mounting your speakers with two screws will most likely result in some rattling. It’s been awhile since I peaked under there so I can’t recall if there is enough clearance to fashion a mounting ring from MDF that could account for the difference, however from the looks of the pics there probably isn’t enough room for that. You might be only left with exchanging your speakers for another set. This DIY is the only one on the internet done right thats still available. 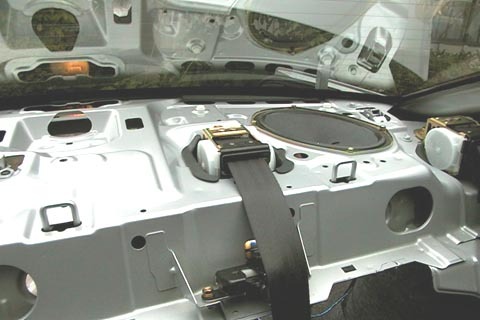 Just replaced my stock speakers in my 02 civic lx coupe and added 6×9 rockford fosgate punch speakers. Thanks so much for this DIY. I just finished installing new speakers. It took me about two hours to complete. I was concerned about fit, so I mounted them on the bottom. Thanks for the guide.